Feminism in Harry Potter: Are the Weasleys feminists? Is the Weasley Family From Harry Potter Feminist? Let’s look at what feminism actually means. The dictionary tells us that feminism is the “advocacy of women’s rights on the grounds of political, economic, and social equality.” The talk of equality sounds all well and good, but things get messy in the application. You’ll get a lot different ideas and opinions on how to be a feminist. Some people will say that every woman must prove herself to be as good—if not better—as a man in everything, even peeing standing up. Others will say that women are naturally gifted in different things than men and that should be respected. It’s sort of a revival of the separate-but-equal idea. Most people are somewhere in between these two extremes. The following criteria capture what I think is the heart of feminism and feminists. You can take it or leave it. Agency—feminists encourage women to act on their beliefs without bringing in gender. Under this analysis, a woman’s particular occupation is irrelevant, as long as she chose it willingly. Respect—a feminist respects a woman’s opinion on a equal standing as a man’s. A caveat is that respect, regardless of gender, is earned, not owed. Individualized judgment—feminists don’t paint women with a single brush. You would never hear feminists say, “All women are X,” since they would consider each woman as an individual with her own strengths and weaknesses. 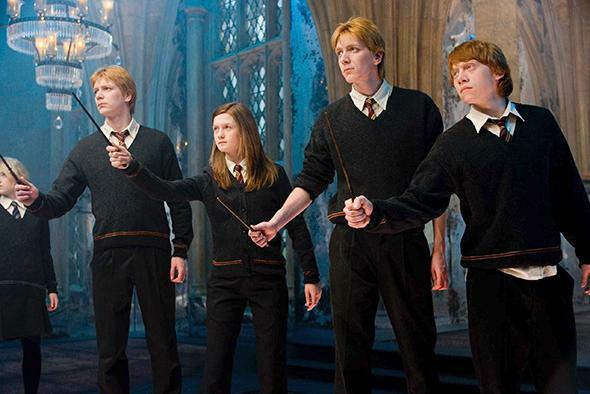 With these criteria sussed out, let’s look at the Weasleys. Since Molly and Ron raised the most questions regarding their feminism, I’ll focus on these two first. Molly’s status as a stay-at-home mom isn’t a strike against her feminism. In fact, she exhibits deep commitment to her children and motherhood, suggesting that she wanted to be a mother. Molly’s work as a stay-at-home mom was a tough one, with Charlie’s dangerous job, Fred and George’s tricks, as well as managing seven kids on a meager salary. She did her job well, with all of her children achieving success and happiness in their lives. During the Second Wizarding War, Molly, along with her husband, was an active member of the Order. The books never tell us the precise nature of her involvement, but she stood up for what she believed in: keeping the Wizarding world safe from Voldemort. Even though it is her traditionally feminine characteristic of overprotectiveness that motivates her involvement, Molly followed through with her own beliefs. Molly is certainly a flawed character. She’s somewhat gullible, overprotective, and risk-averse. Flaws don’t make a female character anti-feminist. Women are imperfect creatures, just like men. To show their imperfections alongside men’s is positively feminist in my book (and good writing). One important thing to remember about Ron before we get into his feminism (or lack thereof) is his immaturity. Throughout the series, Ron shows himself to be impulsive, insecure, and jealous. He improves with age, but these flaws are still there. He gets annoyed with Ginny because he’s somewhat overprotective and shocked that his sister is kissing someone. Ron, true to his personality, overreacts and gets angry at her. There’s certainly a small element of sexism, since I doubt Ron would’ve been as overprotective if it had been Gil, a younger brother. Still, a bigger factor in this scene was Ron’s general idiocy and jealousy that everyone was getting kissed except for him. Moreover, he eventually ends ups with Hermione, a powerful wizard and a brainiac. At first, Ron exhibits jealousy and resentment toward Hermione, but it had nothing to do with gender. His jealousy had everything to do with his feeling of inferiority and his inability to deal with these feelings. To end up with Hermione, Ron overcomes his immaturity and self-pity to be with the woman he loves. Nothing anti-feminist about that. Most of the Weasley men don’t show any indication of anti-feminist thoughts. They listen to and respect women’s opinions. The women they marry are strong, opinionated, and powerful wizards in their own rights. There’s no overt sign that anyone—even the stick-in-the-mud Percy—in the Weasley family actively hinders women’s freedom and agency. If anyone hates a woman, it’s usually well-deserved (like Umbridge). Ginny Weasley, for the most part, is free to pursue her own interests (which include Harry Potter and Quidditch). By all accounts, she’s a liberated woman who doesn’t consider herself beneath men. In conclusion, there’s no evidence that the Weasley family is sexist. In fact, the Weasley family seems to respect and judge women as individuals, which is quite feminist. Why doesn’t Hogwarts School of Witchcraft and Wizardry just get rid of Slytherin House? Who made bigger sacrifices, Dumbledore or Snape? What mistakes did Lord Voldemort make?